Tampering with the adjustment on this thermostat will totally defeat the safety feature. The only recommendation is that a defective thermostat be replaced with a factory calibrated replacement. The probes and the tubing leading to the body of the thermostat are filled with liquid. It is important that while working with these sensors that the tubing not be kinked. If the tubing is kinked or the probe punctured the device will not work and should be replaced. Mount the new thermostat body using the screws or lock nut that were removed in step 3 above. 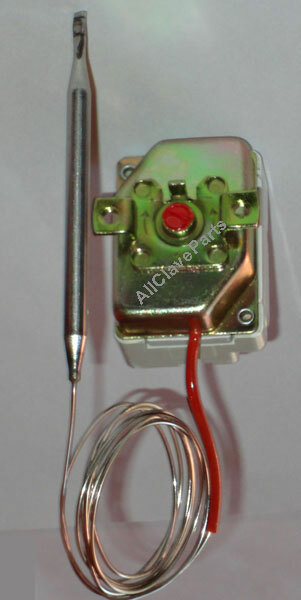 The body of the Cut-Out Thermostat is mounted on the top portion of the mounting bracket. 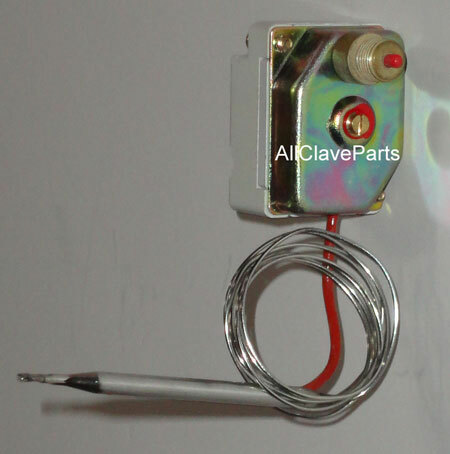 The body of the Safety Thermostat is mounted on the bottom portion of the mounting bracket. NOTE: Improper mounting of the probes will result in a malfunctioning of the autoclave. If the replacement thermostat has a long probe it is only necessary to secure the rear portion of the probe under the rear most element. Retighten the Heating Element making sure that the probe is held securely between the element and the Chamber. It is important that the probes be snug in channels of the Heating Elements. If they are loose they will not make good contact with the Chamber and well not properly sense the temperature. Flattening the channel on the Heating Element slightly is an acceptable way of snugging the probe. Be careful not to connect a high voltage wire to the ground terminal. If the replacement thermostat does not have a separate ground terminal then the ground wire need not be connected. Screwing the thermostat to the mounting bracket will supply sufficient grounding.